Mike Girón is a painter, muralist, graphic artist and educator. He began working large-scale on New Orleans Mardi Gras parade floats in 1992. In the past five years, he has designed and/or painted eight public art murals in Omaha, solely or collaboratively. 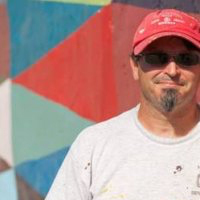 From November of 2013 through August 2014, he has led collaborative mural projects at Creighton University, the Benson Theater, Metropolitan Community College and with Why Arts? These involve an estimated 200+ participants. Another project, working with young graffiti artists, is due to start in September, 2014. The Diversability Mural Project involved the generation of ideas and imagery developed through collaborations between Mike, four WhyArts? artists and participants from Munroe-Meyer Institute, Ollie Webb, QLI and Vodec. Even the painting of the mural was made accessible to all. Mike and frequent partner Richard Harrison received community development awards from the City of Omaha and the Governor of Nebraska for their 2012 Startlab Avanza mural project, which has been nominated for the 2014 Omaha Entertainment and Arts Awards for public art. In 1995-96, Mike mentored in Project Interact, at the University of Colorado, Boulder. This program provided “at-risk” youth, caught doing graffiti, a legal means to paint AND comply with their mandatory community service. He introduced traditional painting methods. Kent Bellows Studio’s project, “Inside/Outside”, generated murals now hanging at the Douglas County Youth Facility through exchanges between students Mike and Richard mentored and incarcerated youth. Mike’s experience as an instructor of Arts began in 1994 and continued at Metropolitan Community College and Bellevue University. His mural classes at BU worked on Philadelphia artist Meg Saligman’s giant mural in downtown Omaha and six public murals for South Omaha. He lectures on murals, including the Mexican artists Rivera, Orozco and Siqueiros.